GYM has been ahead of her time for most of her adult life. Back in 2009, it wasn’t really cool for 20 somethings to write about personal finance. In fact, they weren’t even called Millennials, they were Young Adults. This was pre-minimalism, FIRE, and a host of other recently trendy financial topics. So when GYM started a blog called Young and Thrifty, initially not too many people took notice. Slowly and consistently, with great content and her unique voice, she built the site up into one of the most successful and trusted personal finance blogs in Canada. It was and still is, THE place to go for money advice as a Gen Xer or Millennial in Canada. GYM was also ahead of the curve when she sold Young and Thrifty and decided to focus just on writing. Pocketing the money from her hard work and continuing to write allowed her to hone her craft without the pressure of running a site. Blogging, though, was in her blood and she couldn’t get it out of her system. So in 2017, she decided to start a new site, Gen Y Money. GYM was so incredibly kind and helpful to me in agreeing to share the wisdom she’s gained from her almost 10 years of blogging (that’s basically the equivalent to a 40 year veteran in other fields of employment) and her responses exemplify the simple, yet profound, practicality of her writing. I know you’re going to find the wisdom she shares both highly insightful and actionable!! This is going to sound very silly, but I have an iPhone 5 that I have had since 2013. The battery didn’t hold a charge, and whenever it got cold out it would drop from 99% to 1%. Then, it would turn off. It was frustrating, to say the least. The phone wouldn’t last 2 hours without turning off. I bought an Anker external battery that I saw suggested by The Frugal Gene and then started using that. Then Barry from Money We Have suggested I get a new battery. I didn’t know that you could replace your iPhone battery . So I did, for about $80, and it WAS THE BEST MONEY SPENT last year! It’s still going strong and hopefully, I can keep this iPhone 5 around for another year or two. This is awesome! Not silly in the least. As a valuist, I can appreciate not getting rid of a product just because you want the latest and greatest iteration of it. What GYM demonstrates here is both contentment and self-control. Would it be nice to have the hot new iPhone? Does she get the math behind what a huge expense it is to buy it outright or get a deal with a monthly plan? Each of us makes CHOICES about how they want to spend and invest the money we’ve worked hard to earn. At the end of the day, it’s about opportunity costs, and GYM understands that if she can make her old brick of a phone last for a year or two more, the money she saves can be spent elsewhere or invested. I would recommend scheduling posts ahead of time or to write a lot of content before you go live so you have a buffer. That buffer can help prevent you from calling it quits as easily from blogger burnout. Sometimes quantity is more important than quality and posting consistently is also important. I have a post on blogging in 2009 versus 2017 and how they are different. It’s much tougher now, much tougher. So I’m just past the 6 month point and I have to agree with her, although it’s a bit depressing to think that it’s much tougher now. It has been a slog at times. There have definitely been ups. 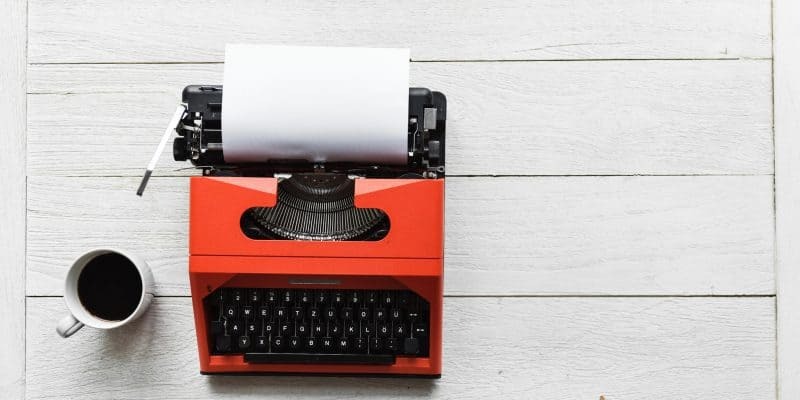 Getting my work featured on Rockstar Finance, having my work appear on MoneySense a couple of times, and getting to write for Young and Thrifty were all amazing. But there have been lots of lows too. I’ve felt overwhelmed at times trying to balance all I need to do with my other responsibilities. It’s in these times that it’s good for me to remind myself (or for my wife to do it for me) that if I miss a post one week, the world will not end. All the people on my email list will not unsubscribe. I will survive and life will go on. It can also be hard when you see other blogs CRUSHING it and you feel like yours is puttering along just fast enough to edge a snail in a 100 meter dash. I listen to lots of podcasts and everyone wants to be that person being featured who’s getting 20,000 pageviews/month after 3 months. We all want to experience the growth that will put us on the blogging map. But it’s not the growth that puts us there. It’s the content we produce. I need to be reminded of that, and that this is not a sprint, that I’m in this for the long haul and that if I stick with it, not only will I improve as a writer, but if I work both HARD and SMART, I’ll see the results down the line. 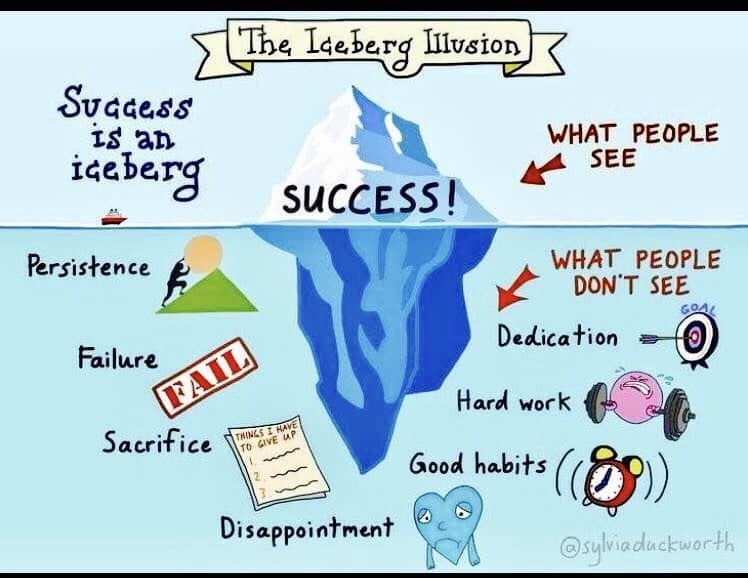 I love this graphic because a lot of us can feel like we’re underwater and drowning from the things we need to do, or feel we need to do, to build our sites. But we’re not drowning. We’re developing. And when we’re the “overnight success” that everyone else is looking at, we can encourage these newbie bloggers to continue to hone their craft and to give them a hand up along the way. That to set up a blog is ‘easy’ and only takes 10 minutes. That first 10 minutes of setting up and paying out that hosting fee ends up being 1-3 hours a day of blog obsession, lol! Blogging is a huge commitment and time vacuum. You get sucked into tinkering with a plugin or creating your MailChimp email campaign or something and next thing you know it’s 2 hours later! When I started blogging, I probably spent, conservatively, about 10-15 hours just RESEARCHING how to start a blog. I wanted to know what platform to use and what the best theme was for my site. Then, since I knew nothing about WordPress, I had to figure all of that out. I’m sure if you want to set up your hosting (I use Siteground and they saved me hours with their KILLER customer support reps answering my questions), use a stock theme from WordPress, and just get your site live, you could set it up quick. But it would look like, how do the French say it…CRAP! The competition in the blogosphere is INTENSE!! People only have 24 hours a day and you’re asking them to spend a small portion of their incredibly valuable time reading your thoughts. The least you can do is take more than 10 minutes to set it up and make it look better than the dog’s breakfast. GYM is also spot on about the black hole of time that blogging can become. I’ve spent many late nights losing track of time only to look up and notice that my wife has tapped out on the couch and I’ve been writing and tinkering with things for the last 6 hours. Blogging is one of those things that I find is never done. I could always use more time to tweak this, or update that, to write that piece I’ve been wanting to or to pitch that blogger I’m hoping to guest post for. At the end of the day, you need to prioritize the Have-To-Get-Dones and the Want-To-Get-Dones. If I get my Have-To-Get-Dones completed on a weekly basis, I feel like I’ve kept my head above water for another week. But truly it’s finding that time to go above and beyond that will set you apart from other bloggers. It’s sending the emails to pitch people, interacting on Twitter, posting to Reddit, creating those extra Pinterest graphics, etc. that will help you experience success faster than those who just do enough to “get by”. That’s how GYM made Young and Thrifty into such an awesome site. She poured her blood, sweat, and tears into it and it showed. I love being productive and it’s been hard not to be as productive as I usually am since becoming a new mom. I have a post on my blog called 4 Productivity Hacks to Increase your Efficiency, and you know what, ironically when I was writing that post, I was in early labour and didn’t even know it. Talk about intense, right? For apps, I like BeFocused (It used to be called Pomodoro or something). You get 25-minute increments and then you give yourself a 5-minute break. Then after four 25-minute increments, you get to treat yourself to a 15-minute break. I don’t have the luxury of that much undivided time now with the little one, but I really enjoyed using this app before the baby. For plugins for the blog, I recommend Revive Old Post (formerly Tweet Old Post) as it shares your old Twitter posts without you having to manually do it. I know some people don’t like auto-posts on Twitter, but it saves me time. I also like Hootsuite to schedule Instagram posts ahead of time. They allow you to schedule a few posts for free. I can’t type out hashtags on my phone so I prefer to type them out on the computer. And, as much as I hate to say it (because there are a lot of posts out there romanticizing Tailwind for the referral affiliate link fee probably), I also like Tailwind because it saves me time and allows me to work on Pinterest once a week or every 10 days instead of daily. I am really scared of heights. My husband and I went to visit Myanmar’s U-Bein bridge in Mandalay. It’s a 1.2 km long teak bridge that was built in 1850 (considered the oldest and longest teak bridge in the world). There’s no barrier and it’s about 7 meters high from the water (depending on how high the water is). I know 7 meters doesn’t sound like a lot, but it is when you don’t have anything to hold onto and you’re walking on rickety teak. Anyway, my husband convinced me to walk along the bridge for a bit (I did about 400 meters and wanted to turn back). Then on the way back, they were fixing the bridge. Like REMOVING the teak boards and putting new teak boards in. All this is while people were on the bridge. The only way to get back was to walk the plank. There was a small 1-foot wide plank that people were crossing. I saw children cross it and an elderly lady as well. As the elderly lady crossed it she even smiled at me as I was having a panic attack. The other alternative was this staircase down to the lake. But the lake was filthy. I thought about climbing down the stairs and wading across the lake instead of crossing the plank, but this opportunity closed as they kept removing old teak planks and replacing them with the new ones, all the while creeping the 1-foot plank closer and closer to where I was standing. Anyway, after crying and receiving bewildered looks from the construction people, I managed to “walk the plank”. So to answer your question, I didn’t handle it very well, but I managed to get back to land! GYM has my respect. She looked fear in the face and, through teary eyes, told it she wasn’t going to bow to it on that day. We all face things every day that scare us. If you’re never scared, you should be, because there’s something seriously wrong with you (you really should get that looked at). We all fear certain things. Maybe it’s failure (check!) or rejection (check for that one too!) or a host of other situations, circumstances or snakes (check!) too long to list. Feeling fear doesn’t make you weak. Bowing to it does. Rather, a person of courage sees past the fear to what’s on the other side, to the possibilities that explode after they’ve walked THROUGH their fear. That’s what GYM did when she crossed that bridge, and when she started her new site. And it’s what we can CHOOSE to do each day of our lives too. Whew, give me a second here to get down off my inspirational soapbox. GYM has been around the block when it comes to blogging. She knows what she’s talking about and we’d all do well to listen to her advice and recommendations. Be sure you are spending your time wisely – Whether it’s scheduling your posts ahead of time, recycling old tweets or using apps like BeFocused, efficiency is the name of the game. After 10 years or blogging, GYM understands the limits of her time and she wants to maximize her output in the use of it. Fight Fear – What’s your U-Bein bridge? The one thing you’re terrified of doing but know you need to. That thing that sits deep inside soul and taunts you from time to time, that you would like nothing more than to crush. For me, when it comes to blogging, it’s traffic. My traffic isn’t where I’d like it to be at this point in my blogging career. I can be tempted to get discouraged or to set smaller goals and just settle for average. Sure, I could set completely achievable goals and pat myself on the back when I reach them. But deep inside I’d know that I’d cheated myself, that it wasn’t my best that I’d given. And I’d wonder what would’ve happened if I had set that MONSTER goal, the one that REALLY terrified me and caused my spine to shiver at the thought of it. I’m fighting through my fear of failure. I’m CHOOSING to act in the face of my fear and to set big goals (25,000 pageviews a month, here I come!). And by doing so I’m choosing to grow, as a person, a husband, a dad, and a blogger. BIO: GYM is a 30-something Millennial new mom from Vancouver, Canada whose goal is to reach $1 million net worth by age 40. 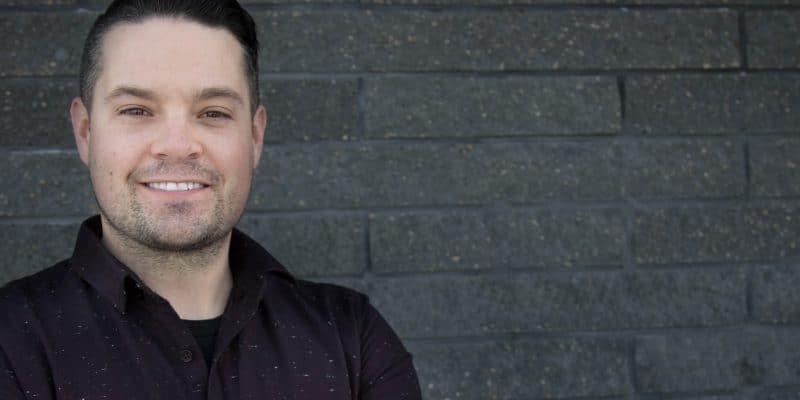 GYM has been personal finance blogging for almost 10 years but is starting fresh on a new website- genymoney.ca. Follow her on Twitter at @genymoneyca. What’s the one thing you’re terrified of doing but know you need to do? Add to the conversation in the comments below or on Twitter @method_money or my Facebook page Method To Your Money. You can also find me on Pinterest. Want more great ideas for mastering your money? Sign up to receive my weekly emails detailing how to keep more of your hard earned cash! Omg I LOVE THIS. Thank you! What nice things you say about me! 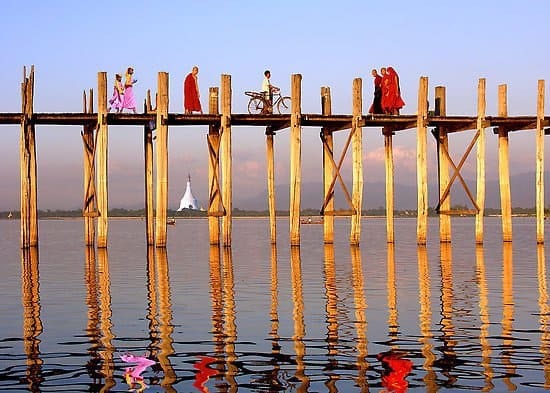 I like the “What’s Your U-Bein Bridge”? Thanks for getting a picture of it that makes it look higher than it really was. My hands are getting sweaty again just thinking about the heights. I think you have done amazing so far, Matt, writing for my old site (how awesome!) and also being featured on Moneysense! That’s “making it” in my books for sub-6 month blogging career! I totally know what you mean about 6 hours going by tinkering with Mailchimp or HTML or WordPress. It is so addictive and there’s always room for improvement or always something else that ‘needs’ to be done. Keep up the good work Matt, and thanks for interviewing me, it was fun! Thanks so much for agreeing to be a part of Band of Bloggers! I really appreciated the wisdom that you shared and your transparency. Thanks also for the kind words! I appreciate it very much!! This is great advice from both of you Matt and GYM! Thanks for sharing the growing pains…honestly, it does feel better to know that 1). I’m not going crazy this is hard ya’ll and 2). We are not alone in this! ~ For the record, I think I spent an insane amount of time on Mailchimp too…doh! Thank you so much for your kind words. It is really hard and it’s easy to forget that this is a marathon, not a sprint. One of the common pieces of advice I’ve gotten from seasoned bloggers is to be sure that you stick at it for at least 1-3 years before you decide if you can make a go of it. I’d lean to the 3 year end of that. I’m in it for the long haul and figure if I put the time and work in, success will be sure to follow! Thanks for taking the time comment! !